Pamper yourself in this 2014 Ford Fusion SE with Keyless Entry, AUX and USB Connection, Fog Lamps, SYNC Technology, Premium Sound System, and EcoBoost Engine! Moving up to the Fusion SE gets you 17-inch alloy wheels, exterior keypad entry, heated mirrors, an eight-way power driver seat (with power lumbar), rear air ducts, a rear fold-down armrest and a six-speaker sound system with satellite radio. The power plant for this Ford Fusion is a 1.5L I4 engine capable of producing 178 horsepower and 177 pound-feet of torque! 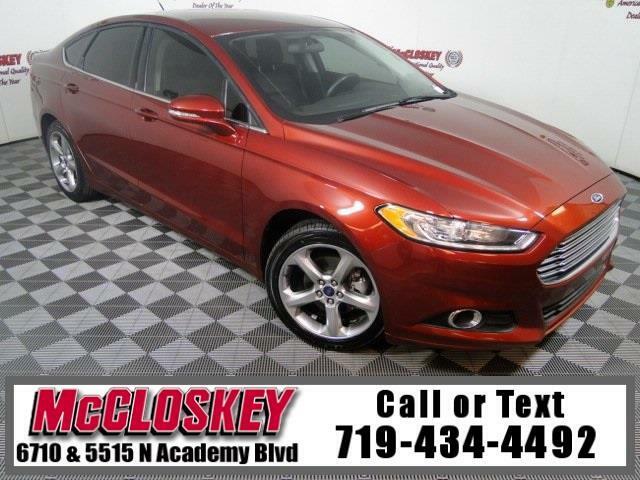 On the highway, the 2014 Ford Fusion offers a comfortable and controlled ride. It's also remarkably quiet. What's really nice, however, is that these qualities don't come at the expense of engaging handling. This vehicle passed our 110 multi-point inspection and is backed by our National Quality Dealer of the Year Award. We are an ''A+'' Better Business Bureau Rated Business. We offer low interest rate financing, low down payments and the highest trade allowances in the state! Here at McCloskey we do things a bit differently, we shop our competition every day to ensure a great value to you. Come on down and experience it for yourself. This McCloskey Assured vehicle includes a 2 month/2000 mile Warranty and a Vehicle History Report!! At McCloskey we strive to provide ASSURANCE, TRUST, VALUE AND QUALITY! Call 719-434-4492.